Are you ready for a new year of killer devices, hacked fingerprints, crooked migration and more? Some of the biggest challenges facing businesses worldwide relate to security. 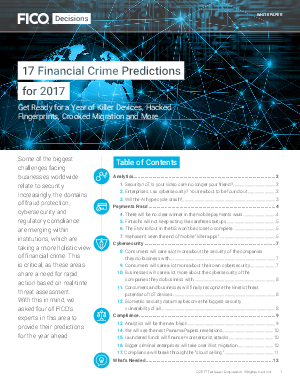 Increasingly, the domains of fraud protection, cybersecurity and regulatory compliance are merging within institutions, which are taking a more holistic view of financial crime. This is critical, as these areas share a need for rapid action based on real-time threat assessment. With this in mind, we asked four of FICO’s experts in this area to provide their predictions for the year ahead. Here’s what they said.